Leading off today: Mount Vernon nearly succeeded in snatching defeat from the jaws of victory twice this month. On Sunday, the Knights went in a different direction, putting together four quarters of quality basketball. They couldn't rattle Fairport and never quite pulled free of the Red Raiders until the closing minutes, but Mount Vernon nevertheless achieved the goal, winning 59-48 in the Class AA final in Binghamton for a record 11th New York State Public High School Athletic Association championship. It erased memories of terrifying roller coaster rides this postseason against Scarsdale -- a 26-point lead evaporated and forced Mount Vernon to win the Section 1 final in overtime -- and Pine Bush, which hacked a 23-point deficit down to four in the first round of the state tournament. "That's what I've been saying since the playoffs started: We really hadn't put four quarters together," senior Noah Morgan told The Journal news. "I think today we did." Sunday's victory ended a five-year drought since Mount Vernon won back-to-back titles in 2011-12 and it allowed the team's nine seniors to exit as state champions. "You want to send the seniors out right," coach Bob Cimmino said. "Now we sent them out in such a more glimmering light. Because they're seniors, they've been around so long. They've taken so many jabs from so many former Knights. They've said, 'Yeah, you're good, but let's see you put your picture on the wall.'" Junior point guard Demetre Roberts had 11 points, four rebounds and five assists to earn tournament MVP honors. He committed just one turnover in 30 minutes vs. Fairport. Jason Douglas-Stanley made four 3-pointers and scored 16 points, the highlight being a 30-footer at the first-quarter buzzer as he alertly pulled up and let it fly as the clock wound down. "I had that big shot at the end of the first quarter and it started to come." Boys Class A: Tysean Sizer celebrated his birthday with 21 points to spark Irondequoit past Our Lady of Lourdes 54-43 for the boys Class A championship. Sizer shot 5-for-9 on 3-pointers and 7-for-13 overall. "Warm-ups I was like 50-50," he told the Democrat and Chronicle, "then in the game it was just falling through perfectly." The Eagles led 37-36 at the start of the fourth quarter. Lourdes' James Anozie (18 points, eight rebounds) made one of two free throws to open the scoring in the period, but Irondequoit then went on a 7-0 run over the next 2:31. The run included a basket by Alex Goldsberry and a steal by sophomore Gerald Drumgoole that led by a 3-pointer by Sizer. Irondequoit coach Chris Cardon, who won his 400th game in December, shares some thoughts following the Eagles victory in the Class A final. Girls Class C: Hannah Morse rattled home a runner along the baseline as time expired, completing a 16-point fourth-quarter rally that lifted Watkins Glen to a 65-63 win over Port Jefferson for the title at Hudson Valley Community College. The Senecas outscored Port Jefferson 28-10 in the fourth quarter to capture their first state title. Amanda Pike, who scored 10 of her 16 points in the fourth quarter, made a long 3-pointer with 1:30 left, then tied the score at 63 with two free throws. 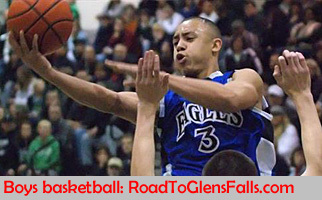 Morse's heroics began with an out-of-bounds play in front of the Watkins Glen bench with :08.9 left. She took the inbound pass, dribbled to the top of the arc and back left for a moment before reversing course and turning toward the basket. MVP Emilia Bond finished with 14 points. Port Jefferson star Courtney Lewis had a game-high 23 points, despite missing the entire third quarter after being whistled for her fourth foul late in the first half. Girls Class D: Heuvelton completed its three-peat with another easy victory, riding UMass recruit Paige McCormick's 31 points to a 78-54 victory over Panama in the final. Madison McCormick added 17 points and Alexandra Steele scored 13. "We always preach team first," coach Rob Powers said. "Paige will be the first one to mention that. She's a byproduct of it. She's able to be successful when everyone else is working together." Heuvelton broke to a 43-22 lead at the half and never looked back in completing a near-perfect season. A mid-season loss to Hammond is all that separated the Bulldogs from a second straight perfect season.